Montpellier beat Nimes 3-0 in Ligue 1 on Sunday but the game was paused during the second half due to crowd trouble. A LIGUE 1 match between Montpellier and Nimes was stopped due to crowd trouble, while a barrier also collapsed during the game. The rivals were meeting in Ligue 1 for the first time since 1993 and Sunday’s clash was packed full of incident. A barrier collapsed during the first half – the day after a similar accident in Eibar’s home defeat against Sevilla in La Liga – but there were no serious injuries. And after the interval supporters from both clubs faced off in the stands, with some fans also getting on to the pitch at Stade de la Mosson. Riot police intervened with tear gas used to disperse supporters as referee Ruddy Buquet opted to stop the game, causing a delay that lasted around 20 minutes. The action resumed once tensions had been calmed and goals from Ambroise Oyongo, Andy Delort and Gaetan Laborde earned a 3-0 win for Montpellier, who move up to second in the Ligue 1 table. Email “Ligue 1 game stopped for over 20 minutes due to crowd trouble as rivals clash for first time since '93”. 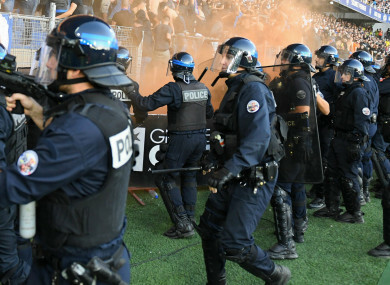 Feedback on “Ligue 1 game stopped for over 20 minutes due to crowd trouble as rivals clash for first time since '93”.